It isn't always possible to attend a live workshop or program, but that shouldn't stop you from having tools, skills and strategies that can help you align with wellness. These free wellness materials are for individuals who are looking to learn what things they can do to significantly and positively impact their health and wellness. You are welcome to receive an electronic copy (ebook) of the Nurture Healing Wellness Handbook. This handbook describes how to use the five pillars of wellness: Mindfulness, Food, Relaxation, Movement, and Joy. In the handbook you will find a description of how to focus on generating the conditions in your life that can serve healing, regeneration and renewal in the body. 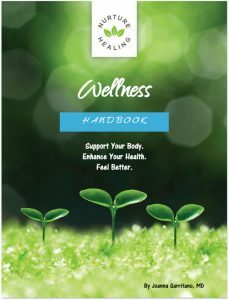 Receive a free digital copy of the Nurture Healing Wellness Handbook. You are welcome to receive a free electronic copy (ebook) of the Super Clean Guide. Today there is so much stress and confusion surrounding our food choices. Everywhere we look there are divergent opinions about what we should and shouldn’t eat. Unfortunately, this confusion creates stress. And more stress is the last thing we need! 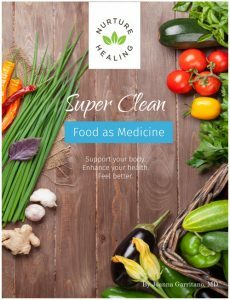 The Super Clean Guide offers well researched principles around food so that you can maximize your health and wellness. This guide also contains delicious recipes and tips to make healthy eating fun and doable. Receive a free digital copy of the Food as Medicine Guide. The practice of mindfulness can help us to make powerful choices to support our well-being and the well-being of our families, our communities, and the greater world. You are welcome to receive 30 days of mindfulness messages to help you practice mindful eating. Mindfulness skills can help you gain greater mindfulness skills so that you become more effective, more present, more aware, and more centered in your life. Receive 30 days of email support for Mindful Eating.